Senator line was launched by the company in 1997 and since its inception it has become a pillar of the entire collection of Glashütte Original. New versions from this line like its predecessors, as graceful and elegant and at the same time, equipped with modern elements. 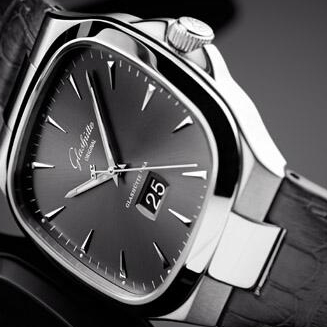 One of the delightful and incomparable model from the Senator line - this is a Senator Perpetual Calendar watch. The novelty, made by hand in the walls of the company, is the epitome of the company's continued efforts of the brand’s masters to a harmonious mix of mechanical and aesthetic components. Ref. / 100-02-25-12-05 / - with a stainless steel case and a matt black dial. All the models are characterized by a harmonious balance of design, clean lines and exceptional color gamut of the dials, on which are clearly visible hour markers and hands. Indication of the day, month and date is carried out by using of black and white figures. In models with a black dial to indicate the phases of the moon is used a black disk, decorated with silver stars and the moon. In models with a silver dial a disk is painted in blue and stars - in silver. The pointer of the year is a system of dots: yellow, black, white and red, signifying a leap year. The dial is protected by an anti-reflective sapphire crystal. The back side of the watch is also covered with a sapphire crystal, which allows enjoying the work of the manufacturing automatic caliber 100-02 at 59 jewels, with a frequency of 28,800 vibrations per hour, power reserve of 55 hours. The mechanism is equipped with a balance on the 18 gold screws, and also features of hours, minutes, seconds, perpetual calendar, moon phase indicator, reset function, i.e. zero, which allows to easily synchronize the second hand with a time signal. Unlike other mechanisms with this feature, the second hand of the Senator Perpetual Calendar model is not associated with winding shaft or the crown. Due to this unique system, with the nomination of the crown balance continues to fluctuate, and the mechanism continues to work, which reduces wear on the material. You can activate by pressing a special button that is located on the lateral side of the case at the 8 o’clock position. A constant power supply is provided by a rotor rotating in both directions. High artistic of the manufactory mechanism has attached to elaborately decorated details: three-quarter plate with the company's "ribbed" surface finish, skeletonized self-winding rotor with inertial load of 21-carat gold, double barrels and subtle regulator "swan neck". An elegant and exquisite appearance of the Senator Perpetual Calendar watches is completed by a black alligator strap, or natural rubber with a folding clasp in red gold or steel.